*Photo Drop Caps not included Please click here for Drop Caps 2oz size is what you need. Each kit should last the average household over one year. *This product not might be worth overseas shipping prices as they can be as much as order. Please see our International ship fees that must be added to cart for out of US orders. Typically we sell large amounts of coffee bean flavor around the world in gallons and drums. As of the last few years many individuals are enjoying roasting coffee beans right in their own home (our own friends included!). 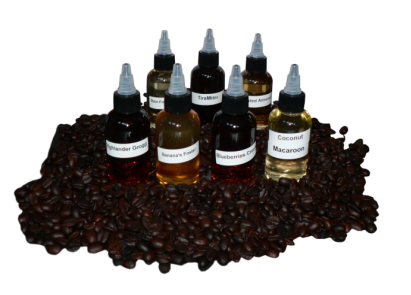 Many people have asked us to carry small 2 ounce sizes so they can also enjoy the professional grade coffee bean flavorings. We are happy to offer these, but we are more set up for wholesale to chefs and roasters who know how to use them - and we do not have a big customer service area because we have not needed one. All we can say is one teaspoon per pound of roasted beans should be more than sufficient and increasing that will do no harm - 5 ml for Europeans who are not sure what a teaspoon is. Also, it does not matter if the beans are still warm or cold. Tossing them in a glass bowl can also work and giving flavor 15 minutes or so to really absorb. [There are six teaspoons in an ounce so each two ounce bottle should flavor 12 pounds of coffee] The flavor sets are shipped 2 day air. We generally need 48 hours to ship. The drops can be used on whole bean or even directly on ground beans as you prepare a pot of coffee. The flavor is so strong one drop in a cup of coffee can be too much, and why you would want to introduce the flavor while brewing. To flavor an entire pot of coffee - figure 1 drop for every two cups of coffee you plan to make. So, a 12 cup brew - you would want to use 6 drops directly on the ground coffee just prior to hitting the brew button, and 8 to 10 drops will not be harmful but probably maximum flavor load. I make espresso by the cup - so I do put 1-3 drops of flavor on the freshly ground espresso after I have "packed the bowl." 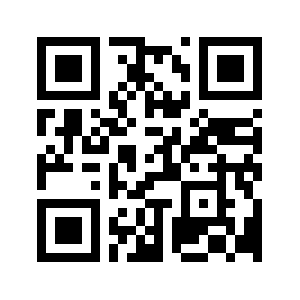 Scan our QR Code for your convenience.